Unless you are one of the lucky ones (damn you! ), your bathroom has somewhere between 25-60sq ft of floor space. And while this doesn’t leave a ton of room for ye olde bidet, there’s ALWAYS enough room for some serious WOW factor! Most small bathroom articles focus on making small rooms look bigger and adding more function – which are admirable topics. But we’re focusing on the FREAKIN’ FABULOUS here people and one way to get freakin’ fabulous in a small bathroom is with contrast. This photo shows a bathroom with some high contrast details. If you take away those darker pieces, the room might feel a bit too soft and subtle to make an impact. High Contrast: One item is drastically different from the other (in depth, colour or texture). The above photo shows how you can add contrast and texture through a consistent theme as well. This next photo shows a low contrast bathroom. Even though there are different sheen levels and products, the overall look is low impact and subtle. INTEREST was added via pattern and texture. Low Contrast: Items in a room have a similar depth and are similar in colour. So what does this mean to you and your loo? b) If you have a small bathroom and want a subtle look, you might prefer a low contrast look. However, if you’re looking for some impact and personality then high contrast might be the way to go! Small spaces can have fun too! Just because you have a small bathroom doesn’t mean it needs to be plain, white and potentially boring so that it ‘looks’ bigger (btw…it’s not). Personally, I’d rather it be small with GREAT personality (like myself – wink, wink) than boring and STILL small. 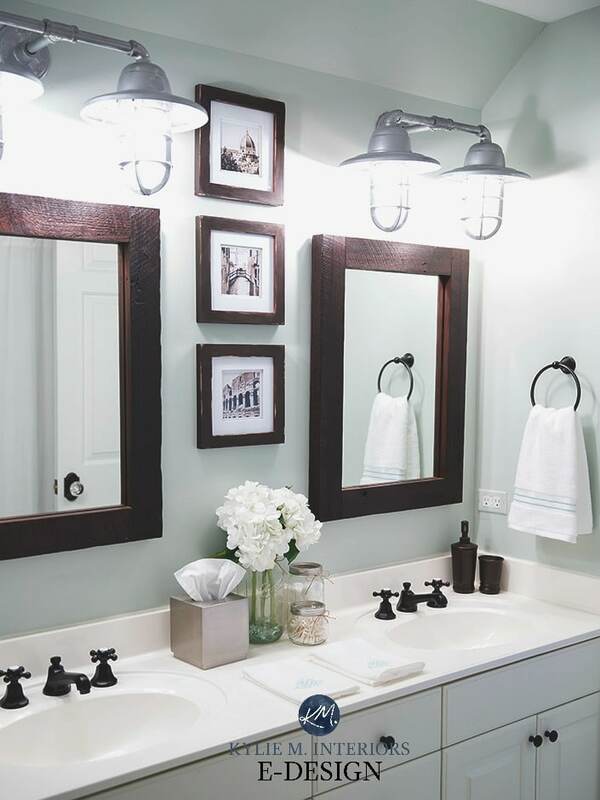 If you’re finding your bathroom a little too plain and boring, consider painting the walls a darker colour. You could also add wainscoting to give a real high contrast effect. Now the interesting thing is that in the above photo, the paint colour (BM Dior Gray) is low contrast with the floor, but high contrast with the trim and white fixtures. You call them shower curtains, I call them bathroom drapes. What this means is that you wouldn’t hang a plastic see-through drape in your living room would you (or in the bedroom, and if so, what’s your address)? Would you mount it on a white plastic rod that has rust on it? Well, if you would then we REALLY need to talk! What I’m trying to say in my not-so passive-aggressive way is that the shower curtain presents a GREAT opportunity to add personality to your bathroom! What could have been a boring little bathroom now makes me a beautiful statement with the addition of a fun and funky pattern. You can also add low contrast interest by layering the same neutral in different products/decor and changing the textures as well. You can add ‘short-term visual interest’ via accents if you have D.A.D like me – Decorating Attention Disorder. The main symptom of DAD is the compulsive need (and yes it’s a need) to change things around on a bi-weekly, or let’s be honest – daily basis. As time goes on, I find myself painting more of my walls neutral as this gives me the flexibility to change up my accents and accessories without having to start from scratch and this bathroom shows a perfect example of a neutral backdrop with flexibility. Most small bathrooms can only handle 1 accent colour (really, the same goes for big ones too). You’ll get more visual impact out of 1 well-used colour than 2 over-used or competing ones. The above shows photos of the same bathroom, with the accent colour pulled around. Granted it is NOT a small bathroom, but it’s the right concept! One of the best ways to add colour AND texture to your bathroom is with those carpets that go in front of the toilet and around the toilet seat lid…SAID NO ONE EVER! Nothing gives me the heebie-jeebies more than mats in front of or ON a toilet, just thinking of them makes my toes curl OH THE HUMANITY! If your walls are a darker colour, your toilet will ‘pop’ and be high contrast simply because it’s white! However, your sink and tub are likely white as well so it won’t look out of place. If you have bone or almond fixtures it will have a similar, but slightly softer effect. If you have coloured bathroom fixtures (pink, blue, brown, purple) then you rock and can just keep on keepin’ on. Matte/flat finish paint in a dark colour on bathroom walls can show more moisture, so if you don’t have great ventilation, make sure you use a HIGHLY wipeable paint or stick to a lighter colour in an eggshell or satin sheen. Want more ideas for decorating your home? Check out my affordable Online Decorating and Color Consulting Services! Thanks for visiting – chat soon! Wonderful! Thank you for letting me know Lily, the feedback helps me figure out what my readers get the best value from – I’m so glad you found some inspiration!! Kylie: I’m currently having my master then my guest bath remodeled. I wanted to thank you so much for your post and your photo . We had a mirror larger than the eye-sore, drop in jacuzzi and so happy to have it removed. My idea was to do white beadboard on the back wall then a very dark gray paint. We have 3 large windows above so I wondered daily if I was making a good decision. Your photo brought to life the conception I have in my mind and now I’m beyone excited. Thank you soooooooo much!!! Thank you so much. I found exactly what I was looking for here. Would you know a ‘small’ bathroom if it bum rushed you? These are nice bathrooms. These are NOT small bathrooms. I AM stressing instead of painting – been reading & rereading your posts. and rereading. and rereading. The underwear and bra thing, though. I love your humor as much as the info! Makes this challenge of trying to figure out how to paint & stage our home with the ugly amber colored pine trim, low natural light, too many doorways and mismatched furniture bearable. Thanks! !